Taxis are the preferred choice for getting around, as they are convenient and are fairly inexpensive for travelers from Western countries. The only downside is that Beijing's congested traffic often results in long jams. 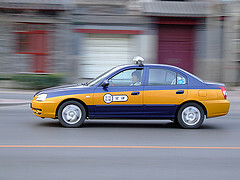 Vehicles used as taxis include the Hyundai Sonata and Elantra, Volkswagen Santana and Jetta (the old model, designed in the 1980s), and China-made Citroens. These taxis are dark red, or yellow top with dark blue bottom, or painted with new colors (see picture). Luxurious black executive cars (usually Audis) can also be found, usually waiting outside hotels. 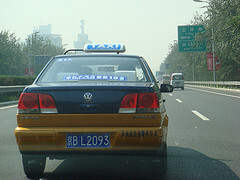 A Hyundai Elantra taxi in Beijing. Beginning from June 2006, all taxis charge a starting fee of 10 yuan, and an additional 2 yuan per kilometer after the first 3km. Taxi meters keep running when the speed is slower than 12km/hr. or when waiting for green lights; five minutes of waiting time equals 1 km running. Outside of rush hour, an average trip through the city costs around 20-25 yuan, and a cross-town journey about 50 yuan (for example, from the city center to the northern side of the Fourth Ring Road). If the taxi driver "forgets" to switch the taxi meter on, remind him or her by politely saying "qing da biao" (请打表). This means "Run the meter, please". Get a receipt (in case you want to make a complaint later or for business reimbursement purposes) by saying "fa piao" (发票) or gesturing at the meter and making a writing motion. If you want a tour around Beijing and its vicinities, you can ask your hotel to hire a cab for one day or several days. It usually costs 400-600 yuan per day, depending on where you go. If you have Chinese-speaking assistance, then bargain down the cost. No matter the cost, the taxi is yours for the day and will wait for you at various destinations. Communicating with the drivers can be a problem, as most do not speak English. You can ask that your hotel write your destination on a card to give to the driver. Make sure also to take the hotel's card (and a map) that lists the hotel's address in Chinese. This can be a 'get out of jail free' card if you get lost and need to get back via taxi. A regular city map with streets and sights in Chinese will help also. All official taxis have license plates beginning with the letter "B", as in "京B". "Black cabs" may look like taxis but their license plates will start with letters other than B. It's nearly impossible to hail a black cab on the streets; they generally hang out around tourist sights like the Great Wall and the Summer Palace or around subway stops. Black cabs will charge you a higher fee for the journey, unless you are a good bargainer, know where you are going, and know what the right fare should be. Sometimes they drop foreign tourists in wrong places. In some extreme cases, the driver may even take them to the countryside and rob them. If you find you hired a fake taxi and are overcharged, don't argue if you are alone, pay the driver and remember the car's license plate number, then call police later. To avoid being taken advantage of, it is a good idea to know the rough direction, cost, and distance of your destination. You can easily find this out from asking locals before calling a cab. Verify these values with the taxicab driver to show them that you are in the know, and are probably too much trouble to cheat. Keep track of the direction of travel with a compass and/or the sun. If the cab goes in the wrong direction for a long distance, verify the location with the taxi driver. For scamming drivers, that is usually enough for them to go back on the right track (without ever acknowledging that they were trying to cheat you). Honest drivers will explain why they are going that way.